Murder by Gaslight: Righteous Retribution. Mrs. Meiar was amiable and lived peaceably with her neighbors, but Christian—known locally as Devil Meiar—was regarded as the wickedest man in that part of the state. For twelve years he would bicker and fight with anyone he met, he never bathed and was horribly ugly, he frightened children, and women shunned him, not just because he was ugly but because he could not open his mouth without spewing the vilest blasphemy and vulgarity. When neighbors’ livestock strayed on his property Meiar would attack and kill or cripple the animals. And he would beat his wife, sometimes so badly that she would seek sanctuary at the home of their nearest neighbor, a quarter mile away. In 1878, Mrs. Meiar was dying of cancer of the tongue and could no longer speak. To ease her pain, her husband would buy morphine, but would only buy five or ten cents’ worth at a time. When she could no longer work, Christian Meiar went to Cincinnati and returned with a woman named Lena Stagner and her 15-year-old son Will. Ostensibly, Mrs. Stagner was to serve as Mrs. Meiar’s nurse; neighbors believed she was to be the replacement when Mrs. Meiar died. On Saturday April 13, 1878, Meiar sent Will Stagner to sleep at a neighbor’s house. The next day Meiar went to the home of John Cavender, casually explained that his wife had died and asked if Mrs. Cavender could come over to “help lay the old woman out” and dress the corpse. Mrs. Cavender went to Meiar’s house and found his wife’s body sitting upright in a dilapidated rocking chair with her head bent forward on her chest. Meiar claimed that the cancer had eaten through an artery and she had bled to death, but the evidence did not bear this out. There was no trace of blood. A doctor who examined the body found broken ribs and blackened finger marks on the neck. Monday, without any ceremony Meiar had his wife’s body buried in a nearby churchyard. The evening of the burial a vigilance committee was organized in the eastern section of Ripley County and they strongly urged Meiar to move away. Meiar refused. That evening Christian Meiar left the house and did not come home until the next morning. When he did return, Mrs. Stagner would later say, “he looked more like a turkey buzzard half plucked than anything else.” He was covered with tar and feathers and had been taken for a ride on a triangular shaped rail. On Tuesday Maier went to Versailles, the county seat, and swore out warrants against John M. Cavender and Joshua Hess for assault and battery and charged them with being members of the vigilance committee. On Wednesday they answered the charge and were acquitted. “Christian Meiar,” Nemaha County Republican, May 31, 1878. “General News,” The Pantagraph, May 1, 1878. “Righteous Retribution,” National Police Gazette, May 4, 1878. 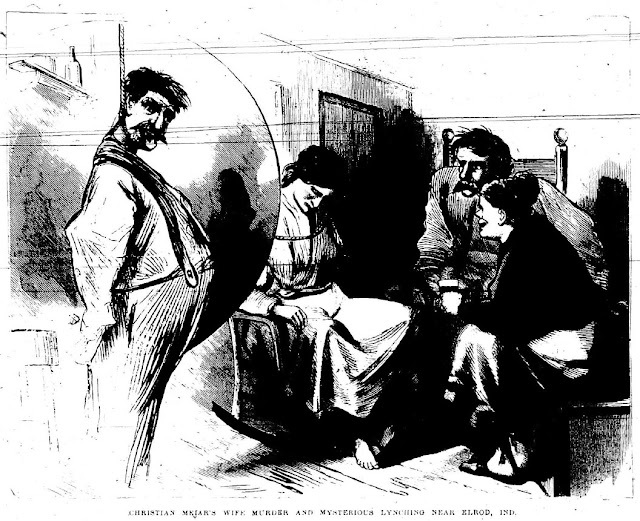 “A Terrible Story ,” New York Herald, April 28, 1878. Based on the described geography, this must have happened in southeast Indiana. katefate, you're right, it was Indiana. Most of the sources were not clear on the state.